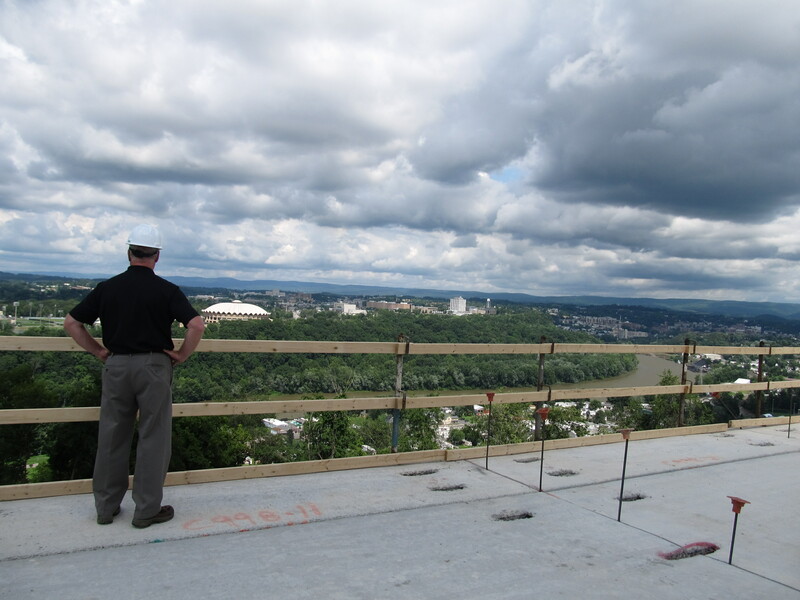 Every other Monday construction involving floor plank begins at the new Courtyard by Marriott in Morgantown, WV. 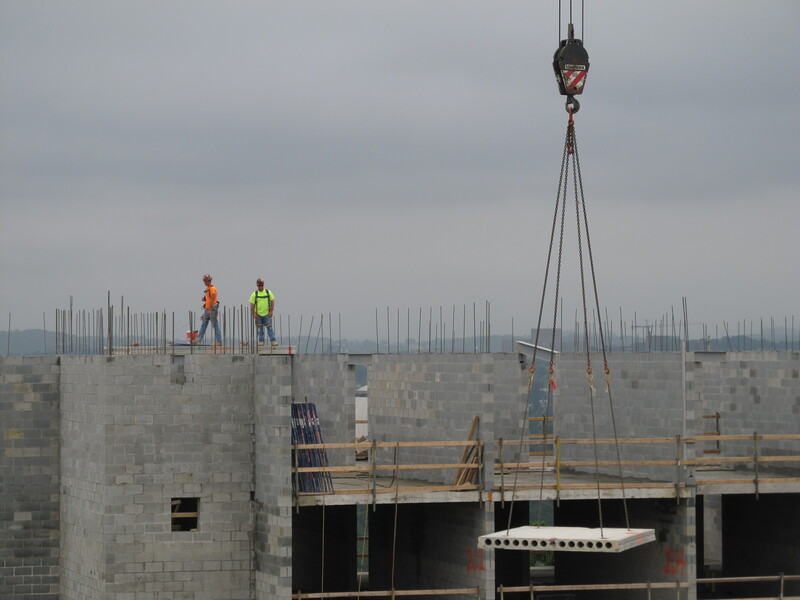 Waller Corporation, the GC for this Courtyard, organizes the rising of the floors left to right across the building, orchestrating plumbing, electrical, concrete and other sub contractors to work out from beneath the floating floor. 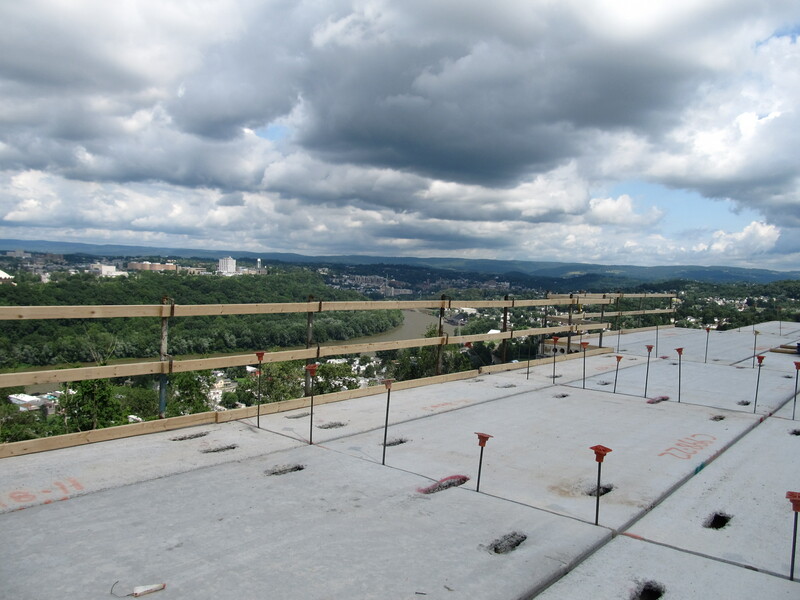 The final piece to the puzzle of precast floor plank is fitting in place. Mills Group worked with Mack Industries last fall to initiate the coordination of the hollow core floor. 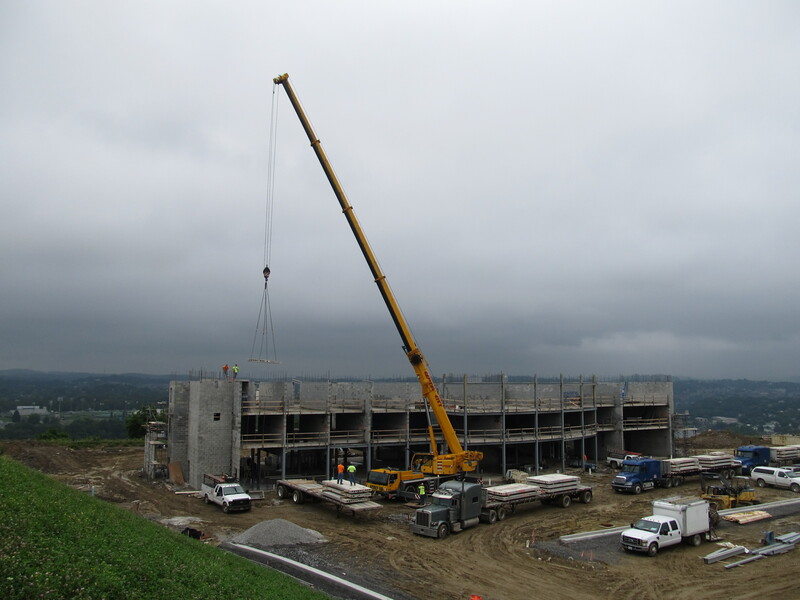 Our team chose to use MACK Industries because they can provide a 30′ long span by 80″ wide plank. This means we have less seams at the ceiling and floor. Mack worked with Mills and Waller to develop a starting point strategy, locate cuts to allow future shafts, and assure edge conditions would align with the exterior wall assembly. The design takes a life of it’s own as a view from the job trailer shows below. Tractor trailers loaded with 4-6 planks arrived on site in succession. Each truck took about 45 minutes to an hour to unload. 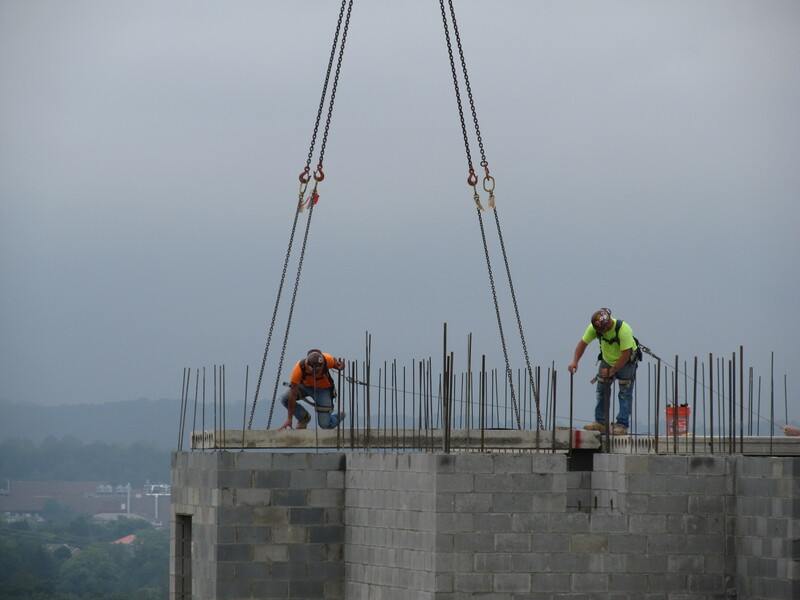 Two workers attached the crane chains from the truck bed into preformed lifting bars in the plank. The plank was lifted, and arrived without incident to the upper floor. From there two tethered men aligned the plank just right before releasing the hooks. The next day three of us from Mills Group were able to walk up to see the view first-hand. Gashes in the floor show areas where the plank was lifted and how two parallel planks are reinforced together. 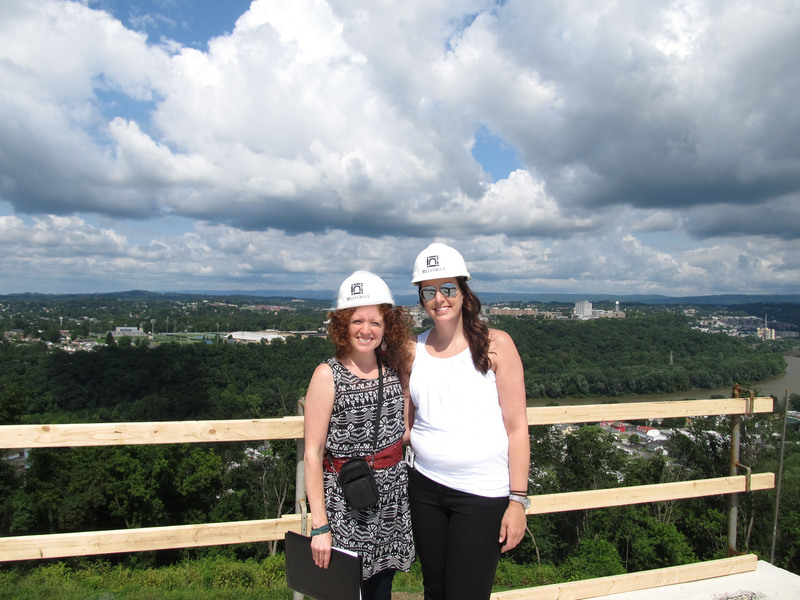 The view is spectacular and we enjoyed pointing out construction details in such a beautiful setting.